How good is your highlight reel? …and just what are you showing to college coaches? Now that many of the club teams and tournaments are winding down until October, it’s important to capitalize on your summer experience. While many parents elect to purchase professional videos from the various events, the quality of the video is only one component of what makes an effective and attention-grabbing highlight reel. In this installment of our College Game Plan Education series, we’ll provide some basic tips for creating and editing your game film to make the best impression on potential college lacrosse recruiters. The goal with any highlight reel is to give college coaches an idea of how you can play the game and the special talents you believe set you apart. 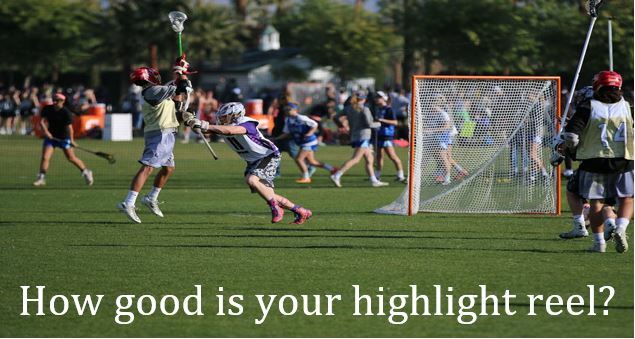 Whether it’s 1-on-1 defense, shooting, open-field speed, or FOGO skills, you want the reel to have a definite theme. Don’t get us wrong, you absolutely need to show more than one skill set, but you want your highlights to be a representation of your strongest attributes, allowing coaches to evaluate how you play and where you might fit in their program. Lacrosse is a flow sport, meaning that the action never really stops. Unlike football or baseball, where a “play” has a beginning and an end, lacrosse can thrust a player from offense to a loose ball to defense in a very short time. This makes editing clips very important. Factors like the quality of your competition, your demonstrated lacrosse IQ, and how you interact with your team may not jump out to a young player, but college coaches can take a lot from the fringes of your video. Typical examples of no-nos would be dodging through several defenders to score a goal despite open teammates, taunting the opposition, performing a solo celebration that is only about you, or passing up a good shot to go for a BTB or other “fancy” shot. If you drop the ball three times on your way to the goal or miss a pass before picking it up to score, the clip should only include the ground ball and the shot. And just as an FYI, coaches usually aren’t terribly impressed that you are good enough to try an advanced move in a game…if it didn’t work, don’t include it. The first 45 seconds of your video will likely dictate whether a coach watches the whole thing, so don’t bury your best clips or try to crescendo at the end. After you show your personal information, take the three most impressive examples of how you play and lead with them. After these initial clips, start to mix in the other aspects of your game to show you have more than one dimension. Continue to pepper in the clips that support your general video theme, whether you’re presenting yourself as a scorer, feeder, ground ball specialist, or defender. Again, the best of these clips should be toward the front as well. For the remainder of the 3-4 minute highlight reel, simply mix in the various clips you have, but with the understanding that sometimes less is more, so don’t add extra clips to get to a certain video length if they don’t truly show your skill level or what you can do. Most college coaches will request a video before they take the time to talk to you, so it’s very important to make sure you’re truly aware of what you’re presenting. Ask your coach to look at it and provide feedback before sending it out to college programs, make any suggested edits, and good luck!! We would like to congratulate Delanie Sheehan on her commitment to UCLA! Here are Delanie’s recruiting story and interview after her commitment. Good luck as a Bruin! The process of getting recruited was really stressful and overwhelming for me. I felt lost, especially at first when I didn’t have professionals helping me. However, into my junior year, my options started opening up and I became more excited than stressed! It was fun to learn about all the different programs and hear their philosophies and learn about the schools. I ended up signing May of my junior year. I will be attending UCLA in the fall of 2017. UCLA has been my dream school for as long as I can remember, so when they contacted me back it was like a dream come true and I was determined to play there, no matter what! I wasn’t going to let this opportunity slip away from me. Their amazing soccer program, along with the academics, has always been what I dreamed of when considering what college I wanted to attend. I want to be pushed in every aspect of my life and this is the perfect fit for it. I feel UCLA will not only help me academically and athletically, but it will help me grow as a person as well. The school’s standards and beliefs are inspiring to me. SportsForce was a huge help in this process. Schools get hundreds of emails every week and sometimes don’t even open them. SportsForce helps you stand out from the rest and give you a professional look. It allowed me to focus more on choosing a school, rather than getting in contact with the school. I would tell them which schools I was interested in and they would find a way to make it happen. I wouldn’t have had the opportunities I had without it. I would say it’s never too early to start. I started really focusing on the recruiting process at the beginning of my junior year, and even this was late. Top programs are ahead of the game and you must be aware of that. Also, highlight videos are important. I caught UCLA’s attention with my highlight video and then they came out to watch me play. When contacting coaches you need something to separate yourself from the rest and a video usually does the trick. My last piece of advice would be not to be scared to contact the coaches. I struggled with this and was always nervous to call, but all the coaches I met were awesome and always willing to give me the time of day. I am so excited to attend UCLA; it feels unreal to me sometimes! I’m proud to say I accomplished my goal of attending my dream school and can’t wait to be repping the Bruins on and off the field!! I anticipate my family saving about half the cost of college because of me being recruited. 7. Would you recommend SportsForce to any other student-athletes? Yes, I would recommend SportsForce to other student-athletes because for most families the recruiting process is new and confusing. It is important to have professionals who know what they are doing on your side. You may miss out on opportunities that you could’ve had. SportsForce gives you an organized plan of action and is willing to help you reach your goals. We would like to congratulate James Percival on his commitment to Hill College! Here are James’ recruiting story and interview after his commitment. Good luck as a Rebel! My recruiting story is probably very different when compared to the norm. 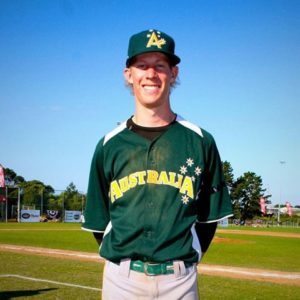 Being from Australia, not too many people have the opportunity to play college baseball and this story somewhat exemplifies the “different path” that many Australians have to take to progress in the baseball world. My process began around February/March 2016 and I had officially signed in June 2016. Obviously, the process was fast-tracked in order to ensure that I would be attending college in the fall of 2016. SportsForce were very diligent in creating a process that would allow me to realize my dream. They were very hands-on via Skype calls and constant messaging which allowed both parties to bounce information of each other in order to expedite the process. All in all, the process was very full, a bit of a blur, and somewhat disjointed but at the end of the day, I will be leaving to pursue a dream next month. I have committed to Hill College in Texas. I ultimately chose this school because I felt as though it was the right fit for me. Knowing that there would be fellow Australians attending my school certainly aided in my choice. I also felt that Texas has a climate which is similar to that of Australia’s and this will certainly help me feel comfortable in my new home. Another reason for choosing this college was knowing that there have been Australians, both past, and present, who have been in the program which testified that the program was excellent and that I would certainly enjoy my experiences playing in another country. SportsForce were very helpful in the process. They put in a lot of hard work and many hours into helping me make this commitment. SportsForce were involved the whole way from the initial emails to finalizing my highlight video and player profile. Their network of knowing and speaking to coaches all over the country allowed me to ultimately achieve the best deal for me and my family. I would say that it is never too late to begin the recruiting process and that if this is something you are serious about, then there are no boundaries. Obviously starting the process much earlier than I did would’ve made the whole timeline a lot easier, but in saying that, anything can result from whenever you begin. Also, having a very good quality highlight video is crucial. This is the main way that a coach can form an opinion on you and what you can bring to their team. Diversifying your footage from both offensive and defensive aspects is also key. I am very excited to be beginning my college career next month. It was only a few months ago when I was wondering if it was all too hard and that I should just begin university in Australia. Now, I have my short-term future settled and not everyone has the opportunity to move to a foreign country, study whilst there, and have the opportunity to play a sport which they thoroughly enjoy. I can’t wait to get over there and see what the future holds for me. Based on my scholarship, I am expecting my family to save around $20 000 – $30 000. Having to pay this out of our own pockets wouldn’t have been an option ad saving this amount of money has allowed me to have one of the great life experiences. I certainly would recommend SportsForce to others based on the positive outcomes that have resulted for me. I only heard about SportsForce through a fellow teammate and they raved about this company, and so do I. Their vast networking potential and skills in creating highlight videos, etc. have allowed me the opportunity to travel to the USA and play college baseball. I’ve already told many Australian baseballers who are aspiring to play college baseball about SportsForce and I will continue to do so. In our work with families, it’s common for student-athletes to be drawn to the NCAA Division I experience. It makes sense. Whether they are true DI level student-athletes or not, that’s typically the only form of collegiate competition they see or hear about on TV or in the media. NCAA DI and DII sports programs offer the most competitive landscape for securing roster spots and athletic scholarships. Only about 2 percent of players are offered DI or DII scholarships, and many of these are relatively small amounts. It is extremely rare for DI or DII student-athletes to secure full ride scholarships. Due to this intense competition, it’s normal for many players at these collegiate levels to ultimately land at DIII schools. According to the NCAA, Division III is the largest division in terms of a number of schools and number of participants and is comprised of more than 190,000 student-athletes and represents 450 colleges and universities throughout the country. Division III is also the only division that does not award athletic scholarships; however, more than 75 percent of Division III student-athletes receive financial aid or have earned a merit scholarship for academic talent and accomplishment. To maintain a well-rounded collegiate experience. Although the sports programs are very competitive and place a strong emphasis on winning, there is an opportunity for the student-athlete to participate in extra-curricular activities like semesters studying abroad, student government and Greek life. To attend strong academic institutions with advanced and well-positioned internships for future careers. 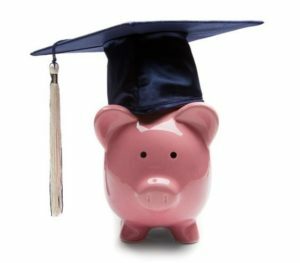 To secure significant merit-based scholarships for academics or other special talents they may possess. So they delivered a total of $141,716, which represents approximately 75% of her entire undergraduate education ($191,064), including tuition, books, room & board. Another great bonus, based on her major (International Business), is that they will send her abroad her sophomore year… at their cost. Finally, they guarantee graduation in four years. 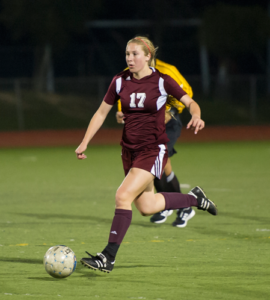 As it turns, she was their top female soccer recruit, but we did not know that until after she committed (her new teammates let the cat out of the bag). Note: She improved her GPA and her SAT scores during the application process, and she promptly notified the University, and they increased her financial package accordingly, which I also liked. In fact, there is now one other scholarship that she is academically eligible to apply for, but she missed the February deadline (because she hadn’t even visited the school yet then, and they really weren’t even on her radar), so they sent her a letter, and they want her to apply next year (the Provost Scholarship), and if she gets it, she will get another $6000 in scholarship money ($2k per year for the last three years), and they will adjust my payments. She is very excited for the opportunity, and I hope that it all works out for her. I will keep in touch to let you all know how she does. Whether your son or daughter has the desire to compete in their sport at NCAA Division I, II or III college levels, Division III institutions may present significant academic and athletic opportunities that you did not know existed.